"Here I painted myself, Frida Kahlo, with my reflection in the mirror. I am 37 years old and this is July, 1947. In Coyoacan, Mexico, the place where I was born". She stated herself as "37 years old" in the inscription but her real age was 40 at the time this portrait was painted. 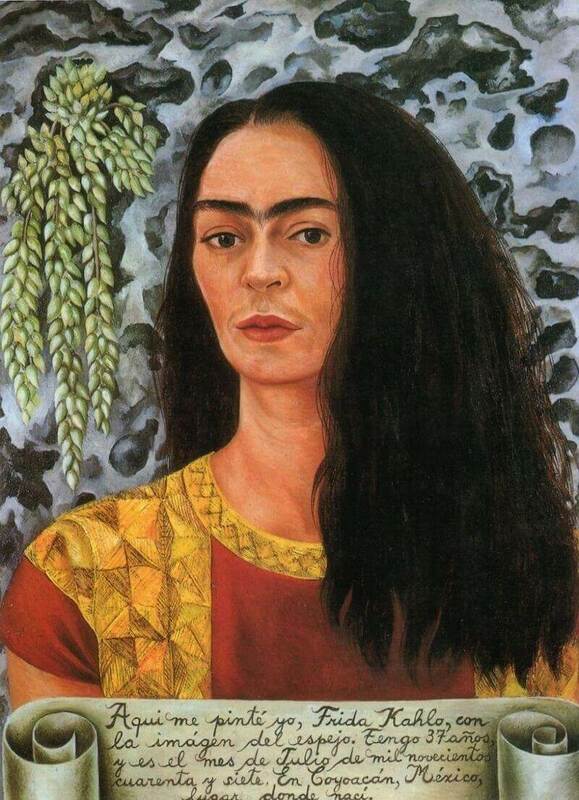 In this painting Frida depicted herslef with large volume of loose hair. It probably because she wants to please Diego Rivera since he is obsessed with her long hair. This painting was auctioned by Christie's, New York, in May of 1991. It was sold for a wowing price of $1,650,000. In the 2003 Miramax Film "FRIDA", actress Salma Hayek played the role of Frida. Salma herself is an amateur artist and panted her own version of this portrait during the time she was shooting this film.